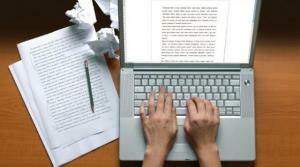 Home › FAQ › How Do You Make a College Essay Stand Out? How Do You Make a College Essay Stand Out? As you begin filling out college applications, you may wonder how to make a college essay stand out. What should you include in your essay? How should you write it? Admissions directors often complain about the lack of originality and quality in college entrance essays. How can yours be an improvement on the average essay? Many students try to write what they think others want to read. They pick up copies of best admission essays and pore over them, trying to get a feel for what someone else considered a good essay. This results in unoriginal essays that sound stilted rather than genuine. Instead, focus on what you want to say, how you want to answer the question. Use your own voice. Write a first draft that is focused on sharing who you are. While sharing who you are, be honest. In a college essay, you’ll be expected to point out your strengths, but you might also need to admit your weaknesses. Your college essay should not be self-aggrandizing. Point out personal attributes that make you a good fit for the school to which you are applying, but resist the urge to exaggerate or use unnecessarily complex words or dense phrasing. Make yourself look good, but don’t make yourself look unbelievable. When answering an essay question such as “How would you be a good fit for this school?” use a unique point of view. Consider famous alumni, the location of the school and the school’s history. What about the school attracts you? This answer doesn’t have to be purely academic. If applying to a liberal arts program in a part of the country famous for its autumn foliage, you might incorporate fall foliage into your answer in some way. When applying to a business program at a school in a subtropical climate, you might mention something about entrepreneurship and tourism. Think outside of the box for your topic. Then build a solid essay based around your unique thesis. While brainstorming for your college essay, you might consider a number of different topics. Once you settle on a topic or point of view, stick to it. It might help to create and follow an outline. After composing your first draft, read it carefully. Get rid of unnecessary words, sentences or paragraphs that don’t point back to your thesis statement. Add any points that are lacking. Make sure your essay ends with a clear, concise summary. Your college essay should be free of all errors in grammar and spelling. Edit and proofread it carefully. Then get some feedback from a teacher or two and perhaps another trusted adult. Let them proofread your essay as well as provide some editorial feedback. Others are much more likely to catch common errors in your writing than you will be, and asking for help in the editing process will usually result in a more polished essay. When applying to college, many students have anxiety over their college essays, according to the Huffington Post. Take your time and use these tips on how to make a college essay stand out. Then send it with confidence.